Ueno N, Hasebe T, Kaneko A, Yamamoto M, Fujiya M, Kohgo Y, Kono T, Wang CZ, Yuan CS, Bissonnette M, Chang EB, Musch MW. TU-100 (Daikenchuto) and ginger ameliorate anti-CD3 antibody induced T cell-mediated murine enteritis: microbe-independent effects involving Akt and NF-κB suppression. PLoS One. 2014 May 23;9(5):e97456. doi: 10.1371/journal.pone.0097456. Figure 1. 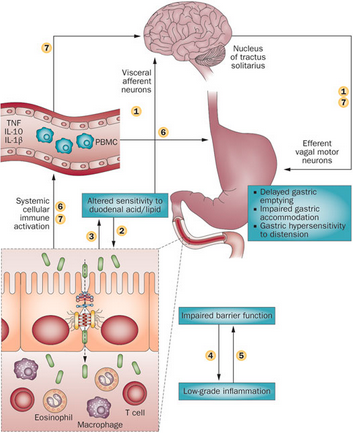 Schematic representation of the potential mechanism involved in the pathophysiology of Gastroenteritis. Enteritis can be induced in the lab by treating cells or mice with anti-CD3 antibodies. These antibodies selectively activate T lymphocytes in the small intestine, which causes the pooling of intestinal contents, and eventually epithelial cell apoptosis. These antibodies have also been shown to increase TNF-⍺ levels in the small intestine and therefore are essential in the development of enteritis. This anti-CD3 antibody response was first discovered in humans in an attempt to suppress organ transplant rejection. Post-treatment, these patients developed a systemic cytokine response, indicating that this antibody leads to inflammation in the small intestine. A traditional Japanese medicine, TU-100 (daikenchuto) is thought to have anti-inflammatory, pro-kinetic, and blood flow effects in the GI tract. The three main components of TU-100 are ginseng, ginger, and Japanese green pepper so the complex is valued as an all-natural, environmental, and traditional form of medicine. Ginger has anti-inflammatory and blood flow effects that can potentially modulate mitogen activated protein kinase, protein kinase B (Akt), and NF-kB activities. Question: Can TU-100 or its components block the effects of Anti-CD3 antibody-induced enteritis? In all mouse studies, only germ-free (GF) and specific-pathogen free (SPF) mice were used to ensure the findings were independent of gut microbes. Mice were given TU-100 or ginger alone by diet or gavage for up to 24 hours then treated with anti-CD3 antibodies. The mice were then sacrificed and a laparotomy was performed to remove the intestine. A segment of the intestine was removed, weighed, and stained. RNA was extracted from this segment and analyzed for TNF-⍺ using Western blot and ELISA. Additionally, human colonic adenocarcinoma (Caco2BBE) cells were treated with IFNy (100 U/ml) to increase TNF-⍺ receptor expression. These cells were co-cultured and treated with TU-100 with Human Jurkat cells to study the interaction and signaling between T-lymphocytes and epithelial cells. -Anti-CD3 antibodies were shown to cause a type of enteritis that is dependent on T cells and regulated by lymphocytes. This enteritis can be classified as gut microbe-independent and independent of intestinal bacteria. -TU-100 and ginger alone, but not ginseng or Japanese pepper alone, blocked the anti-CD3 antibody-induced enteritis by significantly decreasing the amount of fluid accumulation within the jejunum and the stimulated expression of TNF-⍺. -TU-100 also decreased the resulting apoptosis from anti-CD3 antibody treatment in jejunal epithelial cells. -TU-100 and ginger were shown to block the activation of Akt after anti-CD3 antibody treatment, consistent with findings that ginger has been reported to block Akt activation. -In the T-lymphocyte and epithelial cell co-culture, TU-100 and ginger show a block in anti-CD3 antibody induced activation of T-lymphocyte Akt and subsequent TNF-⍺ activation of epithelial NFkB. -These findings demonstrate that TU-100 and ginger do in fact block the effects of anti-CD3 antibody induced enteritis. Enteritis is classified as a Inflammatory Bowel Disorder (IBD), along with a disorder called Ulcerative Colitis. Enteritis is associated with inflammation in any part of the the GI tract, while Ulcerative Colitis is associated with inflammation only in the colon or large intestine. These disorders, along with other small bowel inflammatory diseases like viral enteritis or Ciliac’s disease, remain unclear in regards to cure or effective treatment. Understanding the pathophysiology of enteritis and the effects of TU-100, ginger, or other substances can help extend the potential therapies for gastrointestinal disorders. I found this study very interesting, especially their finding of being able to induce enteritis in germ-free mice for the first time. This has major clinical implications in my opinion. I also enjoyed that the researchers investigated the results of a commonly-used homeopathic medicine, and found that it inhibits inflammation! I am fascinated by their implied model of non-microbe antibody induction of enteritis, and look forward to learning more about it! I found this article very interesting, but I am confused as to the distinction made between the effects of TU-100 and ginger. If ginger was found to be the active ingredient in TU-100 and the other components did not have an effect, why not just investigate ginger as a possible treatment instead of TU-100? Also, what is the component of ginger that blocks the effects of anti-CD3 antibody? I have studied Japanese Kampo medicine, so this paper was particularly fascinating to me. I also am curious about the villus width in Figure 2. At 3 hours, the width increases, but then decreases by 24 hours (most obviously in the AIN76A+TU100 group). Why could this be? Possibly because the treatment caused immune cells to target that area and initiate inflammation, then once the treatment was active, the cells relocated? I would like to see how this treatment would work in patients with IBD or Colitis. I am not at all used to thinking of components of my food as chemicals with a potential effect on the inflammation levels of my intestine, but this paper makes a strong argument that I should! It is also interesting to me that they found ginger to be the component of the medicine that had the greatest effect, because I have always heard from my mom and other sources that ginger is good for an upset stomach. I am curious as to whether the compounds in the ginger are blocking the action of Akt and NF-kB or if they are blocking the upstream signalling of these inflammatory elements. I think that this paper is really interesting and dives into a side of research that is not frequently covered in our academic settings. The fact that these natural products used as food can have such drastic effects in the immune response in the intestines is very interesting. I’m interested in learning more about the villus length further and the way TU-100 interacts to affect the villi in the intestines. Having celiac, I find this research interesting not only for enteritis, but for other intestinal inflammatory diseases. I thought that this article was a very interesting and unique choice of Journal Club articles because of its diverse coverage of medical treatment options. I am curious whether or not researchers have localized the genetic link or mutation in those 20% of patients with Crohn’s related to somebody with IBD that would connect the two disorders (in other words is there any genetic overlap)? What is the actual mechanism with in T-100 or ginger that blocks the anti-CD3 antibodies responsible for playing a part in causing the GI tract inflammation associated with enteritis. I enjoyed reading this paper as the research I did last year was in regard to Crohn’s Disease and this was a completely different approach to tackle the problem and look for therapeutic targets. Also, in general I really like the take on this paper with investigating traditional homeopathic remedies and am interested to learn more about this in tomorrow’s presentation. Finding that TU-100 or ginger can block the many adverse effects of anti-CD3 antibody is huge step towards a therapeutic advancement, especially when this is only the second study of its kind. However, I’m curious as to how these substances are interacting with/inhibiting these inflammatory pathways and a possible model would really help tie everything together. The discoveries herein are quite interesting, especially for only being the second study to investigate the actions of TU-100 on small intestinal inflammation. I’m intrigued by the finding that TU-100, and one of its components ginger, could block enteritis. I’d like to hear more about why they suspect their antioxidant activities could potentially be inhibiting NF-kB and Akt signals, though, as they state in their discussion section. I am often skeptical of treatments that involve natural compounds, not because I don’t believe they work, but because the molecular mechanisms of the treatments have not been studied as much as more traditional treatments. This paper makes a clear, molecular case for the action of ginger on intestinal cells and provides support for what most of us know from experience…ginger is great for an upset stomach! Not only that, but it may be helpful for more serious and chronic GI disorders. I would be interested to see how if these results transfer to other models of IBD. Interesting article! I am curious about the anti-CD3 antibody model they used. They said that this was first discovered in humans treated with anti-CD3 after organ transplants. However, I’d like to know more about how they validated this model with the phenotypes of normal enteritis patients. Do they expect all of their findings here to have the same effect on enteritis not induced by anti-CD3? It was interesting to me that Specific Pathogen Free mice produce a lot of TNF protein than germ free ones. I was wondering what would be the reason why TU-100 makes difference on AIN-76A with different incubation hours. For figure 6, I was wondering if they could use other methods (than western blot) to further investigate the role of TU-100 on activation of caspase 3. Unlike the other two (IκB-alpha and PARP), the expression seems less evident. I was also wondering if they could make a combination model of TU-100 and Gingerol to block activation of TNF since both can block the activity. Which one would be better to treat small intestinal inflammation? I thought this article was particularly interesting because of its approach, While we commonly hear of “traditional” medicines possibly being the answer to many diseases, this article explored what exactly one of this traditional treatments may be doing on a molecular level. By discerning the molecular mechanisms of TU-100 actions on the inflammatory response, that is its effect of NF-kB and Akt signaling, a valid reasoning for its medicinal use is showcased. More studies that investigate molecular mechanisms of traditional treatments would be interesting to explore, because understanding the effects of natural treatments in conjunction with modern treatments could be the answer to improving quality of life for those suffering from a wide variety of disease. It might be interesting to further study why TU-100 and ginger alone, but not ginseng or Japanese pepper alone, blocked the anti-CD3 antibody-induced enteritis. Are the possible inflammatory effects of ginger significantly stronger than the affects of Japanese peppers? How did the ginger treatment affect the amount of fluid accumulating within the jejunum?